Insidious PFAS contaminants are travelling long distances via our waterways but their unique 'signature' can give researchers clues about where they come from so they can be cleaned up. 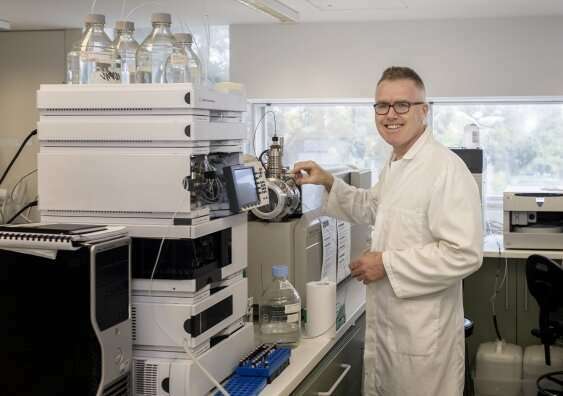 With multimillion-dollar research already underway at UNSW's Water Research Centre (WRC) to work out how to treat and neutralise emerging contaminants in our water supplies, Professor Denis O'Carroll explains that he is undertaking a complementary piece of research into how these contaminants move through our environment. "If we know how they move, we can trace where they've come from and clean them up at the source," he says. Used extensively in products like firefighting foams, paints and waterproofing sprays since the 1950s, these emerging contaminants, which include per- and poly-fluoroalkyl substances (PFAS) (which includes perfluorooctanoic acid (PFOA)), were not originally thought to be an environmental concern. This, however, has changed over the last two decades with them coming under increased scrutiny throughout the world, particularly in Australia, the US, Europe and Canada. One of the most shocking things about these manmade substances is where they can be found. In the US, for example, 97 percent of the population has measurable quantities of these compounds in their blood. "Some studies suggest that almost every person on Earth has them in their bloodstream, which gives some indication of the scale of the problem," says Professor O'Carroll, who is the Deputy Director at UNSW's Water Research Laboratory, and the Director of the WRC. "There is still much uncertainty, and debate, around the health implications, but they have been linked to cancer, and immune suppression in infants." Although alarm bells about the potential health and environmental impacts of these substances have been ringing among scientists since the 1990s, regulatory bodies have only just caught up. Agencies have started regulating them now, down to the nanogram-per-litre, but 70 years of constant use means they are already prolific in the environment. "One of the key problems is that we don't actually know that much about them," Professor O'Carroll says. "We don't know how to treat them or how they travel through the environment." It is the stability of these compounds that makes them incredibly persistent. PFAS, for example, were designed to extinguish fires. When poured over a fire they go straight to the interface between the oil and the oxygen, creating a layer which smothers the oxygen and puts out the fire. But having put out the fire, they continue to travel long distances through the environment via the interfaces, which is unique. Whereas other contaminants might stay in water or soil, PFAS travel easily from water to soil to animal to fish to human etc. This makes the science complicated and monitoring and treatment very challenging. In one well-publicised Australian incident, toxic chemicals used in firefighting foam leaked from the Williamtown RAAF Base in NSW and were found kilometres away in the groundwater, sea water and agricultural and seafood supplies. So how will O'Carroll's team track them? "We're quite enthusiastic about that," he says. "PFAS are made up of thousands of molecules which have their own unique signature. This means you can look at the signature of the contaminant downstream, identify if it came from a groundwater source or a surface water source, then track it backwards." This is important because the signature of the compound enables researchers to work out the best way to treat it and prove who is responsible for the contamination. "Let's say you've got an airport with fire training facilities located next to a company that treats carpets. Either might be responsible for a water source contamination problem, but our methods should allow us to pinpoint with certainty where they came from. You can imagine how useful this would be in the clean-up, as well as any potential future litigation." The primary benefit of this research, which is two years in and half way through, is a clean, uncontaminated environment for human beings and ecosystems to thrive in. But in getting to that point, Professor O'Carroll says, there are tangible benefits for industry too. "There will be huge opportunities for industry to use our research to develop cost-effective solutions to identify and clean up the source," he says. "If we could do that rapidly, that would be ideal."